Australia extends its lead to 348 runs after speeding to 251 for six in their second innings at stumps on Day 4 of the fourth and final Test against India at the Sydney Cricket Ground (SCG). 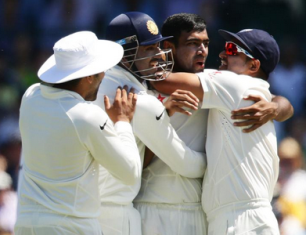 Australia bashed the Indian bowlers all around the park and ended up scoring 213 runs in the final session of play. Captain Steven Smith smashed 71 off 70 balls while Joe Burns plundered 66 off 39 balls to lead a late charge. Smith surpassed Don Bradman’s record to become the highest run-getter in an India-Australia series. He scored 769 runs in the series with 4 hundreds and 2 fifties.